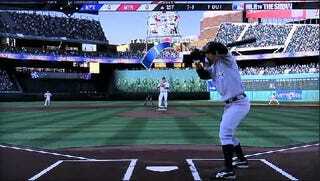 Gametrailers snagged this hunk of gameplay footage from MLB 10 The Show, featuring New York and Minnesota at the Twins' brand-new home, Target Field. This is video of video, so the quality isn't the best for judging graphics, but given Sony San Diego's reputation here, they should continue to be excellent, with broadcast quality presentation. And it's still the first simulation of any kind that I've seen for the new Minnesota park.